King Coal, The Chief, and the "BALJ"
Santa Fe"s line across the summit of Raton Pass in northern New Mexico is the railroad"s highest mountain pass and one of its most challenging. The torturous climb, stunning landscapes, and high-horsepower diesels added up to one of the best shows in railroading and this was especially true in 1994 when Pentrex captured the complete story of Santa Fe operations on Raton Pass. Enjoy the action as loaded coal trains are split and lugged across the grade in two sections behind red and silver Warbonnet Super Fleet diesels. Three units pull and three more push, throttles wide open, lifting the loads over the pass. Witness the struggle of brute horsepower as Santa Fe"s manifest H-BALJ diesels dig in and grind their way up the mountain. Ride in the cab of an AMD-103 as Amtrak"s Southwest Chief high-speed streamliners are brought to a crawl contending with Raton"s 3.5 percent grade. There are surprises in store for the crew on this trip, especially when the train stalls on the steep climb! Onboard scenes, detailed maps, action-filled run-bys, interesting motive power including Dash 8-40CSs, Amtrak Dash-8s, and a new C44-9W, and glorious vistas make this one railroading adventure you"ll want to savor again and again. Pentrex brings you the thrill of Santa Fe"s Raton Pass, 1994! 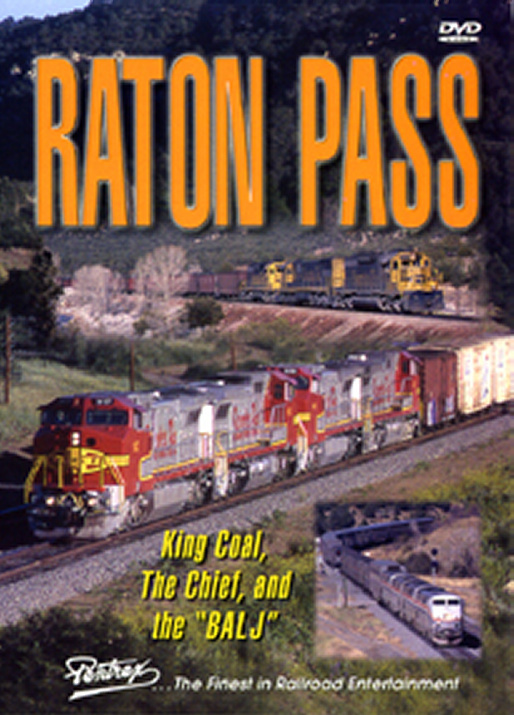 This DVD mainly covers the passage of three of the regular trains over Raton, with more limited coverage of other trains. For me the most interesting part was the trip of the South West Chief, which includes some excellent shots from inside the cab as well as information on the (then) new AMD power and the problems of stalling on the grade. The section on the regular coal train was also fascinating, showing and explaining the challenges of moving heavy loads over the pass. Although quite an old film, these extra features, on top of the many scenic shots of this well known spot, made this still a worthwhile view. Stefan (St.Gallen Switzerland) on 2012-09-18 22:57:04. Working myself in the documentation business (Aviation) I can only concratulate to the well prepared and beautifully realized DVD. Very good filming and sympathetic comment. Also very reliable ordering and delivering service. Thanks! run8anderson (Basking Ridge, NJ) on 2011-03-02 16:55:41. I had this dvd on vhs & figured it was time to update. While the picture quality is not up to video shot these days, it was a great value. TomJ (Kentucky) on 2011-01-16 15:54:08. This is a very good RR DVD! The image and sound quality are excellent, and the subject matter is very interesting. The setting is 1994, which predates the merger with BN by two years, so we get to see locos in the Santa Fe badging. We see the old red and silver war bonnet paint scheme on many locos and the blue and yellow colors on others. We see a coal train split in two and hauled up the west side of Raton Pass with three head end locos and three helpers on the rear. The grade is 3.2% near the summit. The power is lashed up for a return trip to get the other half of the train, and we watch as these cars are also hauled over the summit. Next we get a nice cab ride in the westbound Amtrak Southwest Chief, which stalls going up the 3.5% grade on the east side of Raton Pass. The train had to stop for five minutes to let the main alternator cool off. This was some fine railroad action! chris collins (fletcher north carolina) on 2015-08-30 20:18:08.